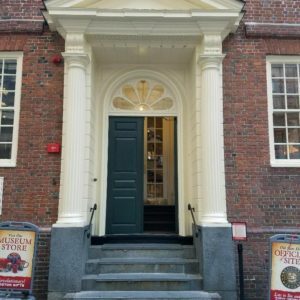 The Old State House, the oldest surviving public building in Boston, was built in 1713 to house the government offices of the Massachusetts Bay Colony. 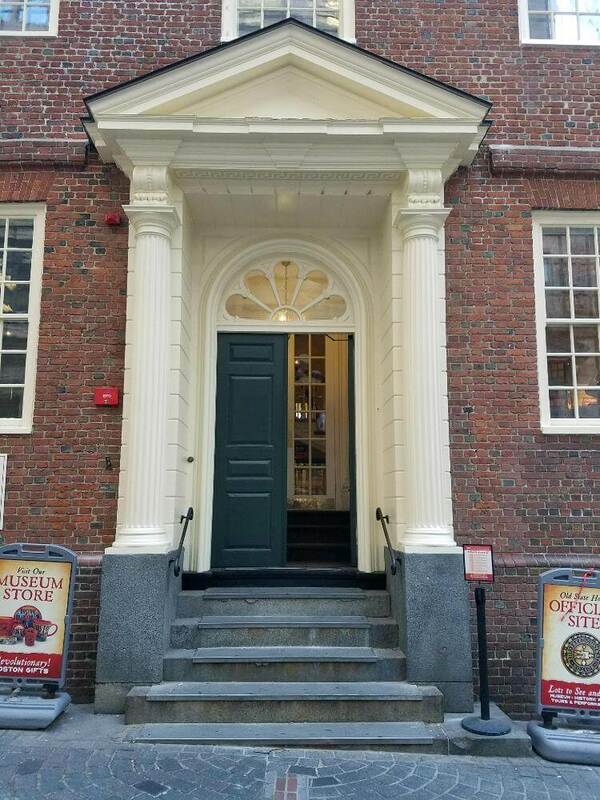 As the center of politics, business and civilian life, the Old State House was the meeting place for economic and local news. 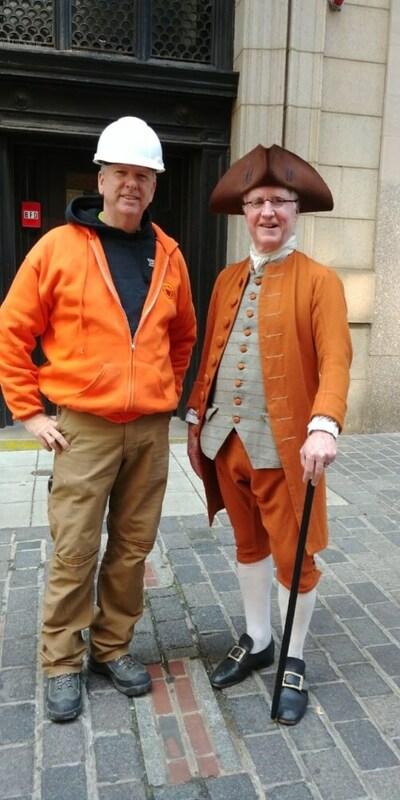 John Hancock and other notables rented space in this building. 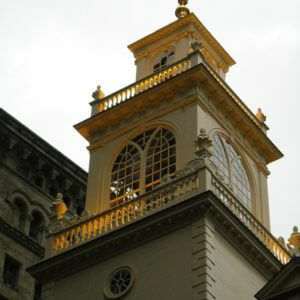 Many refer to this three-story Georgian brick structure as one of the most important buildings in our nation’s history. 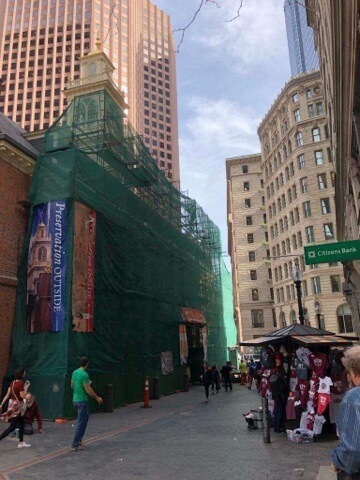 In 1770, the first blood of the Revolutionary War, known as the Boston Massacre, was shed in front of the Old State House. 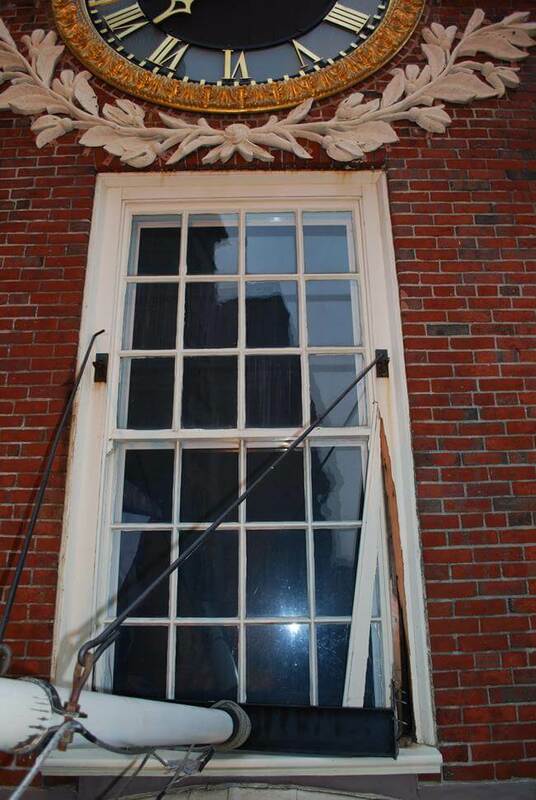 In 1776 John Adams read the Declaration of Independence from the balcony to Bostonians for the first time. 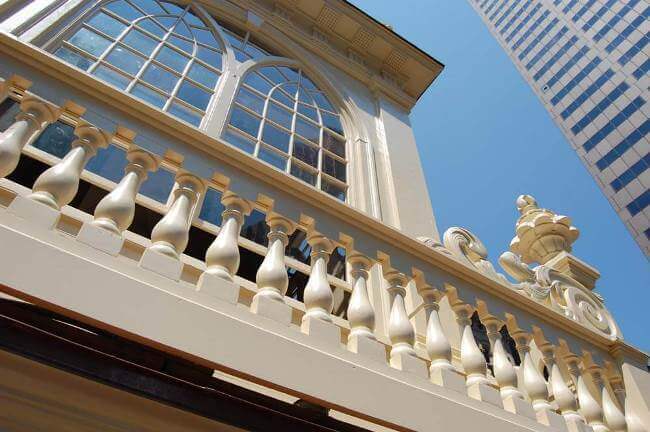 Today the building is a museum and is the most popular tourist attraction of the city’s National Parks. 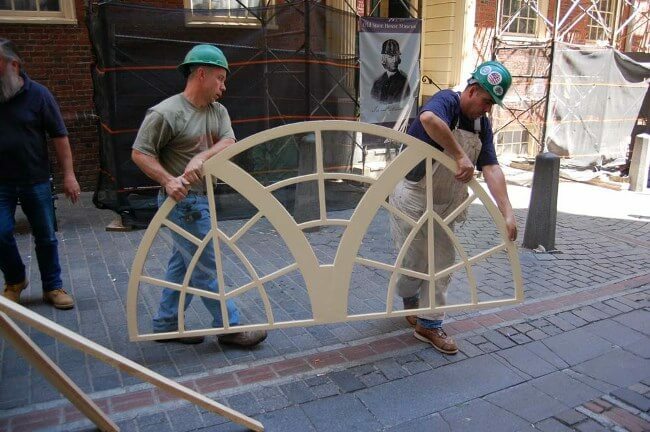 The Bostonian Society takes great care in preserving and restoring The Old State House, and demands the finest craftsmanship and attention to detail, giving careful consideration to every choice between restoration and replication. 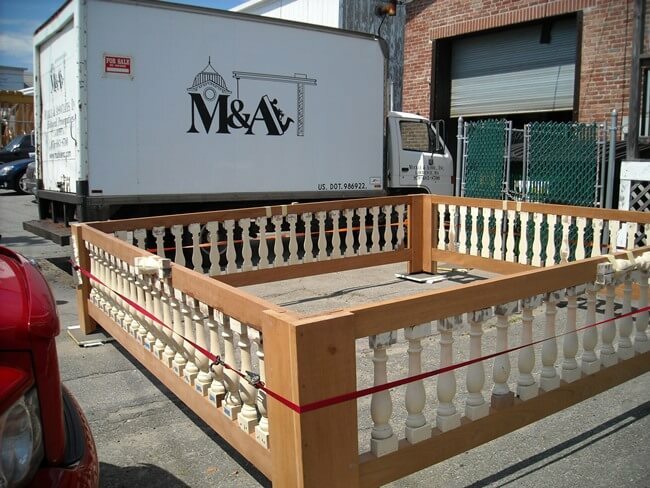 M&A Architectural Preservation has been called to perform restoration work on this national landmark many times, with projects large and small. 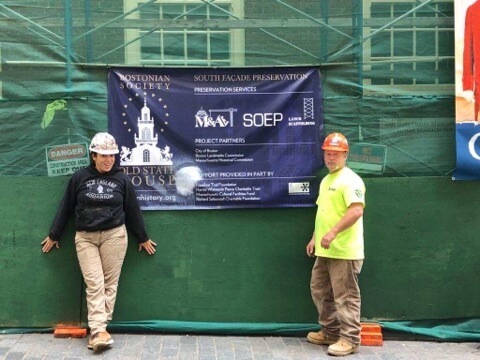 In 2017, M&A was called back for its third restoration project of the Old State House. 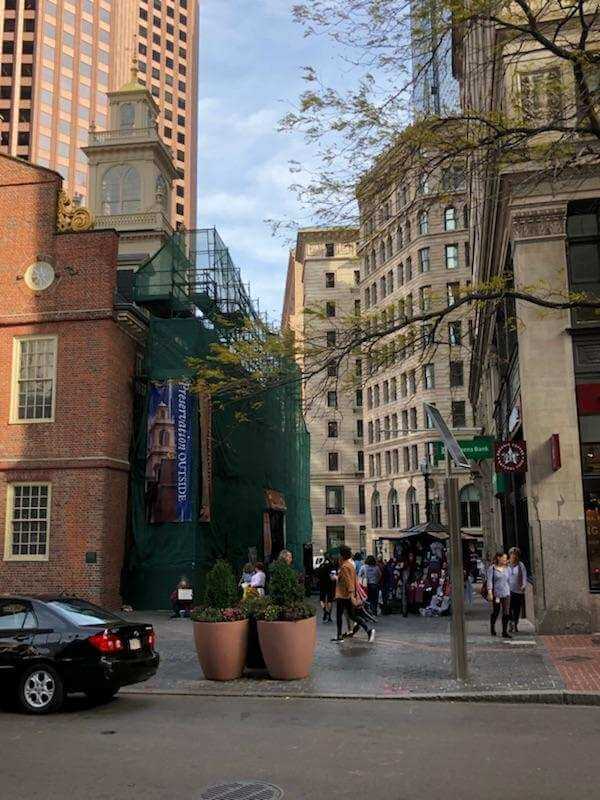 Given its popularity for tourism, timing of the project was carefully planned to not interfere unduly with visitors walking the Freedom Trail and visiting the museum. 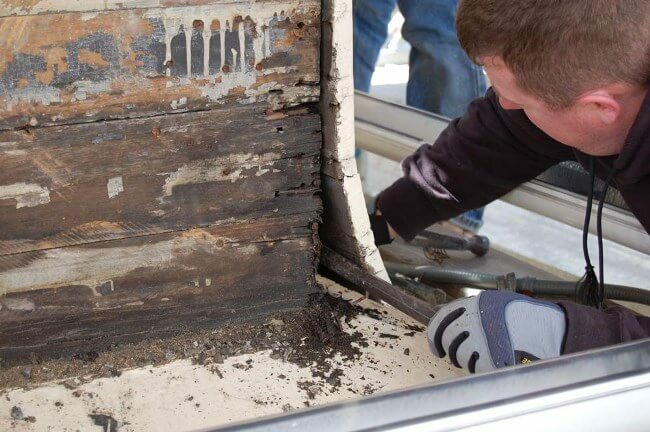 Restoration to the window frames on the building’s south façade, plus extensive re-glazing and replacement of cracked and broken panes with antique. 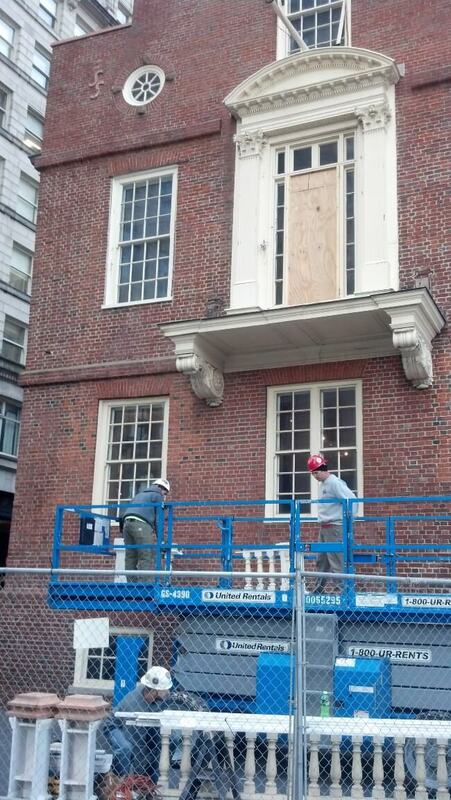 Millwork restoration to the south façade including stabilization and replication of columns at the main entry. Repairs to the slate roof and flashing at the dormers. 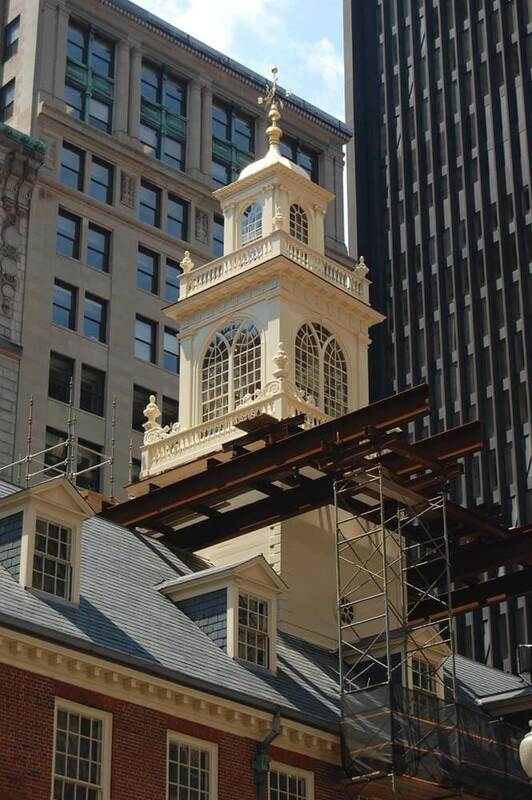 Five years after completing restoration to the building’s cupola and various windows, M&A returned to the Old State House in 2014 to complete exterior carpentry restoration on the east and west facades. 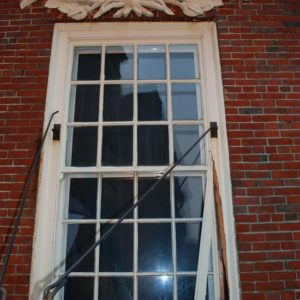 During the project, a Nor’easter blew through and shifted the flagpole on the building’s east façade, causing damage to the window sash, frame, and sill were it was mounted. 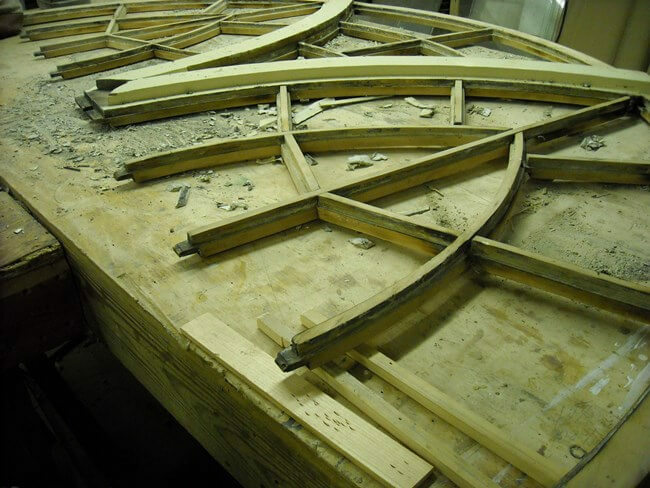 M&A was asked to repair the damage to the window elements, and did so without causing a delay to schedule. In 2009. 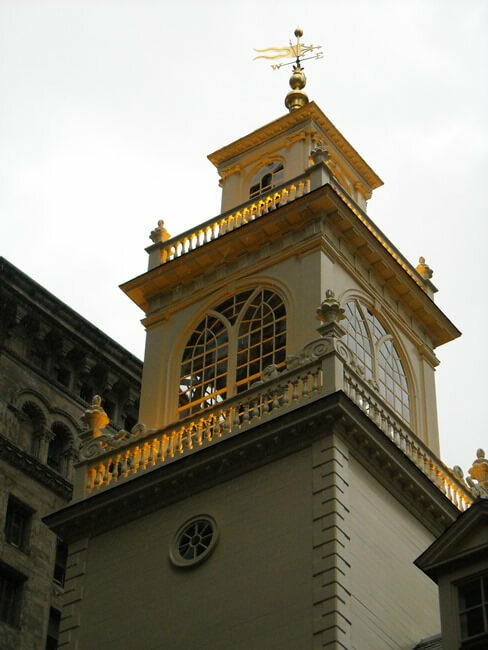 M&A restored the façade and windows of this National Trust revolutionary landmark, including restoration of Massachusetts’ first state house cupola. 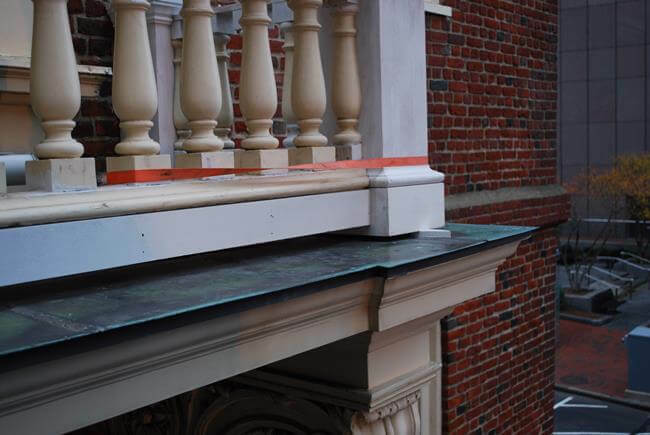 M&A worked with a team of architectural conservators and the National Park Service to determine which elements of the façade had exceeded their useful life, and replicated them with South American mahogany to ensure their survival for another century of brutal Boston weather. 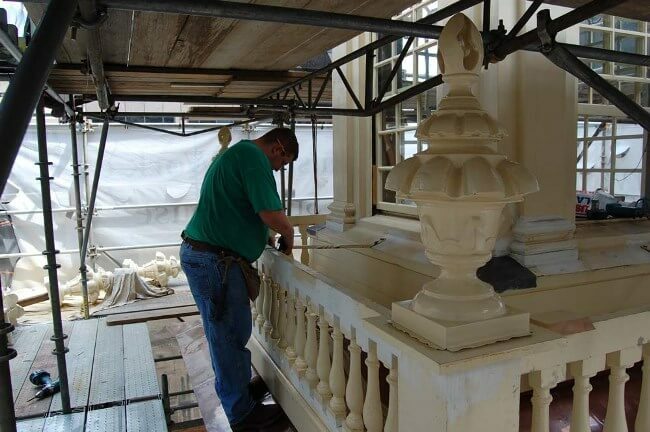 The remainder of the components, including all of the windows, were conserved with epoxies and wood Dutchmen to match the species, grain and joinery.